Modern life is noisy. Even the public library—or should I say especially the public library—sounds like an office building with kids. The hectoring librarian shushing everyone is long gone. Bring the Noise: Eight sounds appear on White Noise’s home page, though the ambient noise app comes loaded with 40 sounds. I’ve been spending quite a bit of time at the library lately. And if there is one thing you need more than anything else at our 21st century “information resource centers,” it is a good set of noise reducing headphones and some pleasant ambient noise to block out the unpleasant ambient noise around you. 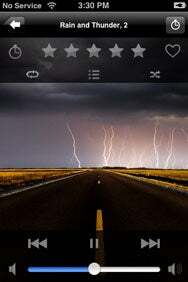 White Noise by TMSOFT is a recent addition to the ambient noise app market for the iPhone and iPod touch. I reviewed Ambiance and aSleep last fall, and I still use Ambiance ( ), which has undergone major changes since my piece appeared in September. More about those changes below. 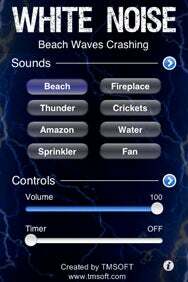 White Noise is a solid ambient noise application with a twist: You have the power to manipulate the pitch and balance of the sounds you are hearing. “Customizable” has been a mantra of mine with just about every app I review, so White Noise definitely scores in that department. The app’s interface is spare but efficient. When you launch White Noise, the app immediately starts playing the default noise. The app doesn’t have a play or pause button. The sound stops playing when you close the app or if you set the app’s timer. The app comes loaded with 40 sounds, with eight sounds appearing on the home page. There are also sliders to control the volume and a timer, which you can set to fade out after a minute or up to 12 hours. To change your top eight sounds, you need to go to the sound catalog, tap the edit key in the upper right, and then move your sounds up and down the list. Customizing sounds is easy. You simply tap the control button on the home screen. You can then adjust sliders for volume, balance and pitch. With the pitch button, you can slow down the sound of a thunderstorm or speed up the hustle and bustle of a city street. Ultimately, White Noise gives you the power to create the ideal sound to relax or work or help put you baby to sleep. The problem with White Noise is a weird and disconcerting clipping of the sounds. You could be sitting at the library writing something, oblivious to the world around you with the sound of white or brown or velvet noise filling your head when suddenly the sound skips or cuts out. What is supposed to be relaxing or helping you keep your attention on task becomes yet another distraction. I noticed this with the “brown noise,” “air” and “city” sounds. This isn’t a deal-breaker necessarily, but it is an annoyance I did not encounter with other ambient noise apps. If you’d like to sample White Noise before buying, TMSOFT offers a free lite version that comes with eight of the sounds featured in full app. Here Comes the Rain Again: Matt Coneybeare radically overhauled his Ambiance app to improve upon the original—though not without tradeoffs. Matt Coneybeare’s Ambiance 2.0 is a radical overhaul of the ambient noise app. I loved the first version, and I still use it when my neighbor’s lawn guy runs his leaf blower on Monday mornings and I’m trying to work. The upgrade is a remarkable improvement on the original, but it comes with certain tradeoffs. Among the new features are a mixing function that lets you put together a series of different sounds—three or four seem to work best—to run on a continuous loop. The possibilities and combinations are practically limitless. The app also lets you shake your device to change the sound, and also includes graphics associated with the sounds you’re hearing. The big change, though, is how you access the sounds you listen to. The original version was a monster of an app, loaded with big, high-definition sounds made to transport you, or at least filter out, the noisy world around you. And even though you could delete sound files, it still occupied a lot of space on your handheld. The new version is a stripped-down player with a gorgeous interface that comes with no sounds pre-installed. Instead, Ambiance 2.0 offers users hundreds of high-quality stereo sounds for sampling and downloading. Obviously, that means you need a 3G, EDGE or Wi-Fi connection for the app to work. You can play any sound you may have downloaded without a Wi-Fi connection, however. And the selection of sounds can be a bit daunting. How many versions of a rainstorm does one really need? Answer: Need’s got nothing to do with it. But if you like, Ambiance has dozens of rainstorms for you to listen to. Coneybeare seems to have built a loyal following for his app. So much so, in fact, that some users recoiled at the upgrade. For the traditionalists, Coneybeare still offers the original, rechristened Ambiance Classic for $1. But for those of us who tend to be suspicious of change, Ambiance 2.0 is an evolution worth embracing.